« McWavering: What’s the Deal-Breaker for Lieberman-Warner? Här kommer mera om debatten inför senatens diskussion nu på måndag av the Lieberman-Warner Climate Security Act – S. 2191. Den här gången handlar det om demokraternas dubbelspel. Utåt så kör de en stenhård kampanj för att införa systemet med handel med utsläppsrätter. Och skriker högljudd när någon påpekar de ekonomiska vansinnet och de enorma kostnaderna för vanligt folk. SAMTIDIGT som det gör ALLT för att STOPPA dessa enorma ekonomiska konsekvenser för deras egen delstat. Och man har varit väldigt skicklig på att ge Bush och republikanerna all skuld. Och massmedia har spelat med i detta drev. Stor fanfar! Här kommer ett ”sensationellt” avslöjande – Det VAR INTE BUSH som stoppade att USA SKREV UNDER KYOTO AVTALET. Utan det var allas älskling president Clinton, vice president Al Gore (Yes, mästerhycklaren själv) och den demokratiskt styrda kongressen som STOPPADE avtalet. FÖR MAN INSÅG DE GIGANTISKA KOSTNADERNA FÖR USA OCH DET ORIMLIGA ATT KINA, INDIEN etc DÄR DE STORA ÖKNINGARNA SKER (Kina är nu störst i världen på CO2 utsläpp) INTE SKULLE BEHÖV GÖRA NÅGONTING. 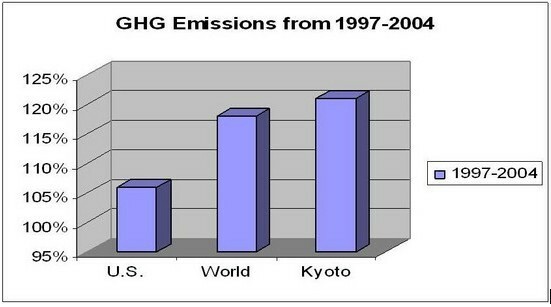 A CO2 graph that says it all!, China ALONE was behind a 54 % INCREASE in CO2 emissions 2001-2006!, The Flawed science behind the Kyoto protocol!, The wonderful benefits of CO2! Följande graf är ju rätt avslöjande: De som har skrikit HÖGST och självgott kritiserat andra för att inte göra tillräckligt har FULLSTÄNDIGT MISSLYCKATS att minska CO2 utsläppen (EU, IPCC, KYOTO avtalet). De som har fört en mera förnuftig och realistisk politik har däremot lyckats MYCKET BÄTTRE (USA). Democrats are lining up to explain their vote against Lieberman-Warner, knowing full-well they will get away with blaming Republicans for its defeat. As I posted earlier, Sen. Maria Cantwell (D-WA) opposes the bill because it is disproportionately harmful to her state, whose energy mix is far less reliant on hydrocarbons; Sen. Sherrod Brown (D-OH) opposes it as he comes from a coal-heavy state that would like to hold on to what remains of its manufacturing base. Unstated but inescapable is that this bill is the biggest outsourcing or offshoring bill in our history. The rest of you will be just fine. You may have wondered why there has been no Congressional effort to actually legislate the ”global warming” policies that will supposedly save the planet from itself. For six years, the Democratic minority indulged in often nasty rhetoric, with the gist being: We know the problem. We know the solution. Your hearings are a delaying tactic. We. Must. Act. Now! After winning the majority, Dems muttered for a while about how that mean George Bush would just veto their legi-salvation anyway: Why bother? We’ll just work for a bigger majority – and the White House. Though, as I have noted on Planet Gore before, Bush had threatened no veto – and on those occasions since January 2007 when he did threaten a veto, in other policy contexts, the Dems typically took it as a challenge to pass something. So there seemed to be something missing from their political calculation, or at least their public rhetoric. Today’s E&E Daily (subscription required) has a hilarious apologia, ”Sponsors lower expectations for Lieberman-Warner bill,” offering a walk-through of the phenomenon afflicting our crusaders. Here as in pretty much every country in the world (posturing notwithstanding), global warming is such a grave threat that other people need to ”do something.” Given the inescapable price tag, lawmakers looked and discovered that anything they propose would actually be doing nothing – besides harming state economies. And if forced to choose, it seems they would prefer it be other states’ economies that are harmed. The Lieberman-Warner-Boxer camp is facing increasing demands from all corners of the Senate to change the bill that would establish a cap-and-trade system with midcentury emission limits of 70 percent below 2005 levels. Ohio Democratic Sen. Sherrod Brown told the Cleveland Plain Dealer this week he was holding out in his support for the Lieberman-Warner bill because it did not do enough to protect his home state’s manufacturing jobs while still stimulating investments in alternative energy. ”I have serious concerns about any climate-change bill that doesn’t take into account energy-intensive industries like we have in Ohio – glass and chemicals and steel and aluminum and foundries,” Brown said. Sen. Maria Cantwell [NB: Democrat] of Washington said in an interview that she is also pushing for changes in the Lieberman-Warner bill to benefit her home state’s abundant supplies of hydropower. ”We want to make sure people who are already good at reducing CO2 emissions will continue to do that and not be penalized,” she said. Cantwell explained that she has not joined the bill as a cosponsor because she wants to keep working on it. Sen. Kent Conrad (D-N.D.) said he wants a more beneficial emission allocation system for his state’s rural energy producers.” Obviously, I represent a state that’s a significant power producer,” Conrad said. ”Most people don’t think of North Dakota that way. But we produce electricity for nine states. We have the largest coal gasification plant in the country. We have very large reserves of lignite coal.” [Meanwhile], Sen. Ben Nelson (D-Neb.) maintained that he is a long way from backing the Lieberman-Warner bill. Instead, he is taking a close look at an alternative climate bill circulated from Sen. George Voinovich (R-Ohio) that opens with tax incentives for new energy technologies but falls back on cap and trade if the other ideas have not worked by 2030. The scuttlebutt is that this year’s annual ”Embarrass the President on His Way to the G-8” resolution will come in the form of an amendment to the Lieberman-Warner cap-and-trade rationing scheme scheduled to come to the floor June 2. That is, the posturing by Sen. Joe Biden (typically with Sen. Richard Lugar) demanding that President Bush ”return to the negotiating table” and stop being so irresponsible. Sure, the U.S. has the world’s most dynamic economy, and yet has still managed to reduce the rate of increase of its carbon emissions more than any Party to Kyoto (and in the odd year, even reduce them) – but where is the flashy rhetoric, the breast-beating, and the empty promises that will supposedly make people who don’t want to like us suddenly like us? So it is useful to read that ”Yvo de Boer, head of the U.N. Climate Change Secretariat, told reporters after talks among environment ministers from the G8 and major emerging countries ”it’s clear now that the consensus is for an aspirational goal for 2050 rather than a firm goal.” That is the U.S. position, and the objective of the U.S.-led Asia Pacific Clean Development Partnership, the obvious alternative to Kyoto – but one that we’re not supposed to call an ”alternative,” so as not to offend the UNFCCC. All of which means that the world has come to see the wisdom of what the U.S. has been saying all along, even if they can’t quite figure out how to achieve our actual performance. So we need to cut it out. In short, the Biden amendment calls on the U.S. to stop being the world leader. This entry was posted on 1 juni, 2008 at 6:58 e m and is filed under Miljö - Environment, USA. You can follow any responses to this entry through the RSS 2.0 feed. You can leave a response, or trackback from your own site.